What a cultural year for France in Korea ! We've seen French musea send key works to Seoul and Daejeon (respectively Musee d'Orsay and Musee d'Art Moderne de Saint-Etienne*), the nation return Oegyujanggak books to their homeland**, and now our top private collector display some of his goods to the Korean public. Francois Pinault is quite a figure in France, and his rivalry with fellow billionaire Bernard Arnault considerably added to the legend. Both are tough predators and acute businessmen who transformed their fathers companies into global conglomerates, and they've often been fighting on the same turf, starting on the internet with Kertel and Libertysurf, before the masstige carnage between PPR-Gucci and LVMH. But they are diametrically different characters : while the short and rough Pinault claims his earthy roots, cultivates a powerful network of fellow Bretons, and often attends the games of his Rennes Football Club ("his" at the affectionate as well as financial levels), the tall, polished, and distant Arnault positions himself in quasi-royalry circles and points out the piano as its main hobby. Their rivalry has shifted into the art arena. And if Arnault had more opportunities in his youth, Pinault started his collection much earlier, gaining a strong reputation in contemporary art circles. France totally lost face when he dropped his project in Boulogne Billancourt : initially, his foundation was to land on Ile Seguin, the site of Renault's historic factory on the Seine river (a dramatic landmark signed Tadao Ando), but local authorities erred... and a once in a lifetime opportunity popped up in Venice, where the billionaire snatched Palazzo Grassi before taking over Punta della Dogana (re-enter Ando), dwarfing the Biennale di Venezia from across the Canal Grande. LVMH eventually opted for Bois de Boulogne and serial museum designer Franck Gehry. After being converted to contemporary art, Pinault became as passionate as Pompidou. The magnate is not just letting his staff signing checks and piling up names in wharehouses the Citizen Kane way*** : he is involved in every purchase, befriending artists, following their progresses... and of course contributing to their own successes (BTW : there is no accounting for taste but personally, I would rather pick Bourgeois, Bacon, and Kiefer than Warhol, Koons, and Twombly). For the first time, parts of Pinault's treasures are exposed in Seoul : at SongEun ArtSpace until November 19. "Agony and Ecstasy", the classic thanatos / eros thema, is served by the usual bling bling suspects : Jeff Koons, Damien Hirst, Takashi Murakami, and Cindy Sherman. Why SongEun ArtSpace ? Maybe Pinault felt some sympathy for the late founder Yoo Sung Yeon, an art lover who made his fortune in less glamorous industries. You want more contemporary art from France ? 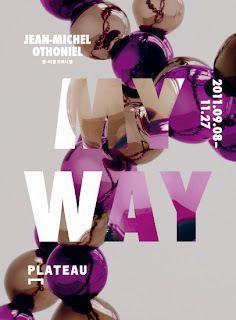 80 Jean-Michel Othoniel works will be exhibited at galerie Plateau starting this Thursday. First of its kind, this comprehensive retrospective is also organized by Centre Pompidou, with the benediction of The Institut Francais de Coree du Sud, another eminent resident of this Sungnyemun neighborhood (OK, the IFC is comfy, the Cafe des Arts yummy, and Sungnyemun about to reopen as a fantastic landmark, but I surely miss the old Centre Culturel Francais next to Gyeongbokgung !). I remember Othoniel's monumental glass necklace, but the artist has obviously investigated many different media, sometimes at a more intimate level. To the point lust is supposed to be dripping from "My Way". If the former Rodin Gallery permanently hosts one of the Gates of Hell, I guess Othoniel aims at inferno's second circle. ** see "Oegyujanggak books returned"